Keyword research is the most important element in any SEO campaign. Google’s search results are based on keywords. Type them in, get the results. No research = no dependable keywords, no title tags, unfocused blog calendar, missing opportunities. Keyword research done right = easy planning, a list of content titles, services or products laser targeted, and security from knowing you are investing wisely. It is great being at the top of the search results. But you can be at the top of Google’s search results and still have no traffic – it depends on the keywords you optimise for. 4 How to Determine Your Competitors Keywords? 12 Is the Keyword Increasing or Decreasing in Value? Keyword research is the cornerstone of any website that expects to get traffic from Google. The same research can be used for running Adwords campaigns and for creating your internal linking guidelines. The usual starting place is Google Keyword Planner – but it is best to leave that till later in the process. In fact, it is a horrible place to start. If you enter “keyword research” into the planner it will not output the keywords we will find easily below. Google Keyword Planner will output the same results to everyone – so you and thousands of others will be chasing the same traffic. This post will walk through the process of optimising this post for “keyword research”. First thing is to enter the term into Google. Have a scan through the websites in the search results. I can see straight off that I am not going to rank for keyword research. The first page is filled with huge websites that have thousands of links. These are very competitive keywords that often have little buyer intent, like insurance, gambling, SEO. These terms, although sending huge amounts of traffic, don’t convert well. Body key phrases consist of normally 2 or 3 words, usually have good buyer intent and normally have a few thousand searches per month, (SEO is not a great example). Long tail key phrases have 4 or more words, they are normally specific, and they make up the bulk of Google’s searches. So even though one page may not get much traffic, added together they can generate huge amounts. From the above it can be easily seen that your effort is better invested in Body and Long Tail – in fact with a bit of imagination, you will use both on the same page. Pay attention to the suggestions in Google while you are typing. Google suggest will show related keywords. I want to avoid tools; I am promoting a service – though these other suggestions could be the title for a post at some point on keyword tools we use. I scan down the search results again, once again I am competing with mega websites for the term keyword research for SEO. So be it. The first Irish website is listed at position 23. I now have my second root term and I will build out a list using these two. But I am going to add another to it, “keyword research for Adwords” – SEO and Adwords are my main business, so let’s see if the post can rank for both. I now have 5 terms on my list – the main keywords prefixed and suffixed with SEO and Adwords and I am keeping the root term keyword research. I now have eleven keyword terms on my list. Back to Google’s search results. Scan down the page looking at the titles of the search results. The first three results start with “How to do” – I can prefix this to some of my keywords. How to Determine Your Competitors Keywords? Your competitors online and offline may be different companies. So search in Google for the target keyword. Open their website and scan down the page. Firstly, what is the title tag, what other keywords are in the description? What keywords are used in the heading and sub-headings – add them to your keyword research list. Interestingly, for the optimisation of this post keyword research of competitors appears often in the titles and throughout the competing pages. SEM Rush is a great SEO software. Take each of your competitor’s domains or URL and add to their search box. They will give you a list of organic keywords that the page or domain ranks for along with some other useful information. If you have a paid account, they will also provide all the keywords that are being bid on in Google Adwords. Often you will get more information on keywords from the Adwords competition research. SEMRush will also show you the adverts your competitors are using. Other websites that offer similar services are Keyword Spy and SpyFu, although I love SpyFu it only provides data for the US and the UK. The main problem with targeting any keyword research in Ireland will be a lack of data. Although the above tools are great, search volume from SEO and Adwords in Ireland is so low that often these keyword research tools don’t provide much data. The anchor text of links pointing towards your competitor’s domain or URL is a clear pointer to the keywords they want to rank for. Most anchors should be the domain name, company name, some irrelevant, and stuff like click here. That makes it easy for the important anchors to stand out. Go to Majestic and enter the domain or URL and then proceed to Anchor Text in the Menu. This is the type of keyword cloud they will display at the top. It is fairly obvious from the cloud that most links to this page are using either the domain name, and or research, keywords, guide, and definitive. Taking on Backlinko head to head is not a good use of resources, this is simply an example of what you can see with your competitors. Below the cloud on Majestic, they list all the anchors and how many times it has been used. As you find relevant anchors add them to your list. We can estimate this value now by taking all the keywords you have and adding them to Google’s Keyword Planner. The above screenshot from Keyword Planner shows the number of searches per month, Competition, and Suggested bid. In general, suggested bid is the best indicator on how valuable a keyword is in its niche market. Google’s Average Monthly Search figures are quite accurate, but they can be off – high or low. The Competition ranking is Adwords related and not organic search. It is much better to test keywords in Adwords before committing to a long and more expensive SEO campaign. I have a limited campaign running in Adwords for SEO audit, Monday to Friday and only during office hours – it is one of my main services. It can be seen from this campaign that the amount of searches for SEO audits are higher than the estimates in keyword planner. This is good, I would hate to build a website based on that data to find out it was lower. Once you have decided on keywords that are right for your page make sure the keywords are included in the page text. Too often I see words added to Title tags and then not include in the page text. Let’s get the rubbish out of the way quickly. There can be huge traffic from these terms, but good luck trying to make money out of them. You get the idea. This post is informational. Informational can work very well bringing first time visitors to your site, then helping to build an email list, or even understanding how much work is in something and therefore contacting you. Converting informational can take a while, but it is needed if you are running any inbound or social media campaigns. 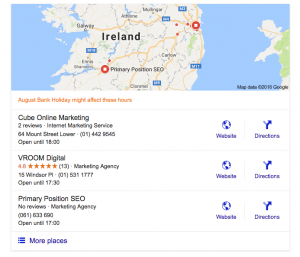 Product keyword focus on brands, categories, and specific services, (especially when service have a location name like Dublin). Usually, these searchers are still at the comparison stage, and maybe even price shopping. But they will convert if you can put forward a great landing page. I think of these searches like I would be. I have been thinking of buying for a while, I am now ready to pull the trigger, I have looked at lots of different site, and I can’t remember any of those sites. I, like most, would have will already have my credit card sitting on my desk in front of me. These keywords convert extremely well. Remember the value of keywords. Check these keywords in GKP for the CPC. This will only cost a few hundred Euro. Set up an ad group based on the keywords in your list. Use less than 20 words. Write your adverts and start testing. The aim of the test is twofold: confirming the amount of traffic for the words, and confirming you have buyers or enquiries from these terms. Lots of traffic, lots of clicks, no buyers, and a high bounce rate will confirm quickly you have more work to find the right target keywords or your landing page is not appropriate. On 1,000 searches per month, at number 1 in the search results, you can expect about 15% of the traffic, which is €300 per month in expected profit. Add your own numbers per URL on your website. Remember Keyword Planner’s results are only exact match – so there will be many more related searches. It has been said that Google does not rank websites, that it ranks pages. That was true in the past – not now. Authority website are ranking pages simply down to the number of links to the root. It is even more difficult if you are selling brand products where Google is like to list 5 or 10 pages from the brand website completely excluding independent websites from the first page. Massive websites with lots of great quality links are going to win over your site that has only a few hundred links. Install the Majestic plugin. Even if you don’t have an account with them you will see some limited data. If all the websites you are intending to compete with have thousands of links or are well known brands, it is unlikely you will have success. In this case take some time and find keywords that are less competitive. Long tail terms are usually great for blog posts. It is great to create a post and see it gain traffic month after month – really it has to, there is so much work now in creating a great post the return has to be there. This section will be covered in depth in another post. But here are some places to find long tail keywords. Is the Keyword Increasing or Decreasing in Value? One last place to check before pulling the trigger is Google Trends. It can be seen from the above graph that the searches for keyword research peaked in August 2010 and after a drop has remained fairly steady. I am surprised by this information. I would expect more people to be researching now that more know about SEO. Any thoughts? What do you do differently?